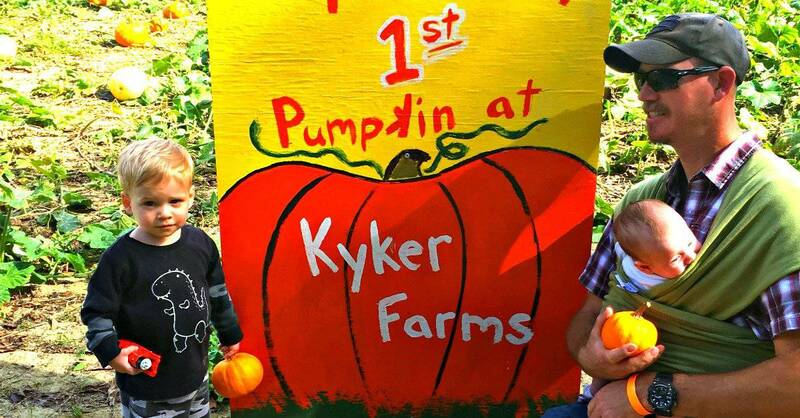 Kyker Farm Corn Maze and Pumpkin Patch is a wonderland of family friendly fall fun. With a variety of awesome attractions for both kids and adults, they truly have something to please everyone. Check out the photos and descriptions below to plan your trip! This farm offers a great pick-your-own pumpkin experience. I have been to a lot of pumpkin farms in my life and I have NEVER seen a farm that offers a variety of pumpkin options. Here you can choose from a carving pumpkin, pie pumpkin, or decorative gourde. You will have to pay for each pumpkin you pick. Kids under 2 are able to pick a little baby pumpkin, from a designated patch, for FREE! Another amazing feature of this farm is that they have several corn mazes. Although the large elaborate maze requires a paid ticket, they have a couple smaller mazes that are free to walk though. Some people enjoy the thrill of getting lost in a corn maze, but it’s not really my thing, especially with a toddler. These smaller mazes were perfect, because we finished up in about 15 minutes. 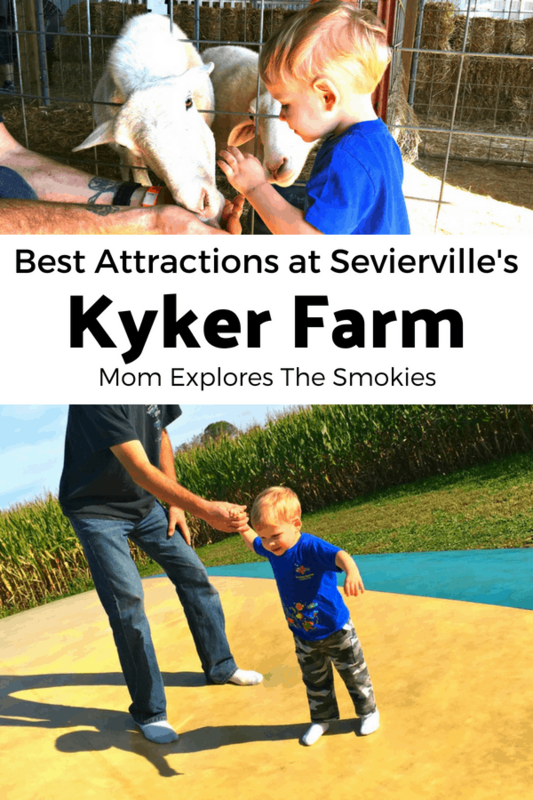 The Kyker Farms playground is awesome for anyone in elementary school or younger. They actually have 2 really HUGE slides that even adults can go down. For the littles, they have smaller slides, swings, and a climbing area. This attraction was included free with purchase of paid attractions. No one wants to visit a pumpkin farm without a petting zoo, and this one did not disappoint. It is actually inside the barn, which helps to keep both the people and animals out of that roasting mid-day sun. We spent a lot of time here because it was a nice relief from the heat. This attraction was included free with purchase of paid attractions. Also inside the barn are petite hay tunnels perfect for toddlers and young children to crawl through. They were definitely a hit. This is so cute. It is clearly something they built themselves, which makes it even better. The duck races consist of 2 hand pumps that feed a water into 2 separate troughs. Your goal is to pump out the water faster than your opponent so that your rubber ducky reaches the other side first. This attraction was included free with purchase of paid attractions. Of course this is a fitting addition to any corn maze, and it was actually my 2 year old’s favorite attraction. We literally had to pry him out of here, and I have to admit, it did look amazingly fun. It is essentially a huge vat of corn that you swim in. It’s nothing fancier than that, but sometimes it’s the little things in life that bring you the most joy. This attraction was included free with purchase of paid attractions. If you are picking a pumpkin, you can take a fun hay ride out to the patch. Of course, you can also take the hayride on its own. They also offer a popular Zombie Blaster Hayride after dark, where you can shoot the un-dead along your route. Another after dark attraction is their haunted trail, which offers frightful fun for anyone who dares to enter. While it is a slightly different concept, this is somewhat similar to a bounce house. The fun is exactly the same!